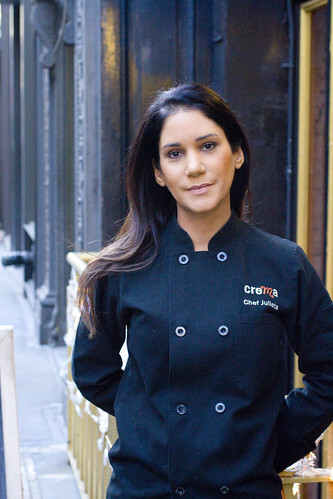 Chef Julieta Ballesteros has always dreamed of being a chef. She came to New York from Northern Mexico, to go to The French Culinary Institute, and describes her first place as a small taqueria. 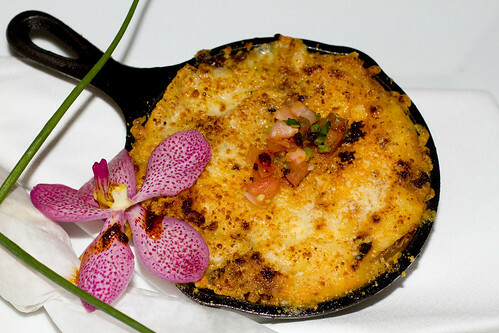 But Crema 111 West 17th Street, New York, NY 10011 is a full restaurant, her baby, where each plate is her canvas. Her artwork stems from her richly flavorful Mexican background mixed with French influences, my kind of Frida Kahlo. I’ve been to Crema for brunch twice, and loved it both times. I consider it one of the most under-appreciated restaurants in NY. Take this dish for example (she demos it in the video below), with so much going on. A beautifully prepared duck breast is the centerpiece for a poblano mole sauce, a potato chipotle flauta, some amazingly spiced plantains, and a sprinkling of pomegranate seeds. No skimping here. After this demo, I got to eat this dish and I have to say, it’s delicious and I have to eat it again. I’m planning on bringing Lon back for it. The flavors draw from French, Asian, and Mexican influences, put together in a way I could not have imagined. Mole is so easy to make! I had no idea. You can make it and use this sauce on just about anything for a week. Remember to score the skin side of the duck breast so it doesn’t shrink when you sear it. Marinate duck breast in soy sauce, serrano, and garlic overnight. It’s juicy and stands alone quite nicely. The fried ripe plantains are seasoned with spices, cinnamon, salt, and sugar. OMG. It’s so good. You can buy her Crema Spice Blend at the restaurant, or call (212-691-4477) and they can mail it out to you. Did you notice how she served the duck breast, sliced, but not all the way through? I’ve never seen that before and it’s beautiful, so definitely copying that one. So after all this, Julieta was so sweet and made me some of her Quesos Flameados to try. It’s a Chihuahua cheese casserole with your choice of chorizo, gruyere, mushrooms, chicken, or a mix. The dish is served piping hot with soft corn tortillas and guacamole to eat it with. You know how much I love melted cheese so this was heaven for me. When you order it, just know that you’ll get a bigger portion because I begged her not to give me too much because I knew I wouldn’t be able to resist. For a generous portion of beautiful food, packed with flavor, you now know where to go! posted by jessica	at 07:24 PM	Filed under Un-Recipes, Video. You can follow any responses to this entry through the RSS 2.0 feed. Both comments and pings are currently closed. This place sounds incredible! I like finding out about underappreciated restaurants. I’ll make a note to visit soon. Wow, never made mole sauce…the dishes look amazing…lovely presentation as well. Nice pictures! She’s gorgeous, too! The dishes sound incredible. I never thought to put Asian, French, and Mexican together…what a medley! Had a bit of trouble playing the video…ok to begin with then kept stopping..might be my lap top..I’ll give it another go though. You posted some serious foodie pics here Jessica, Baz will be on my case to do this now!! He loves duck :o) Thanks for sharing this, it’s great to see different ideas! First of all, I’m pretty sure I’m in love with this dish. Mole – awesome, plantains – even more awesome. Together – mind-blowing. Second of all, Crema is being added to my list of places to eat. Sounds amazing! Anyone else having video trouble? Sorry Les. Joanne, I feel the same way. I was give a choice of dishes she could demo and the sound of this one, duck, mole, and plantains …the words on the page practically looked edible. 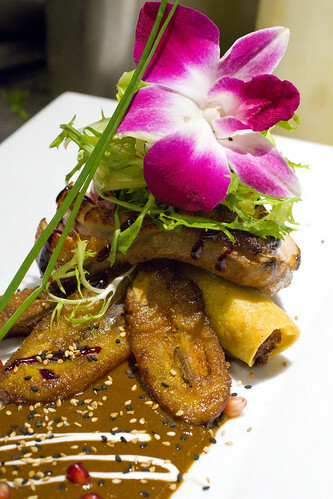 The duck with the mole and plantains sounds absolutely terrific! She is beautiful, and so is her food! I’ve always been wanting to try mole. I definitely want to check this place out! First, I love, love, loved that video. What a pleasure to watch such mastery done is such a nonchalant manner. The presentation was like watching fast motion architecture. I was so enthralled as it evolved on the plate. Yes, for some reason I had trouble with the video too – it did not seem to buffer and would just stop. I even paused it to see if it would buffer enough to play longer. Ah well, it was OK since this was such a cool segment. Keep em coming, thanks. Sorry for the video problems. We thought this new way would be better but guess not. Lon is looking into it. I was taken with this post. You gave an artist some due credit and it was a pleasure to be introduced to her. Latency on your site (in general) really seems poor. It’s just a really slow web site. Slowness problem is really too bad; because your stuff is great! An upscale to mexican contemporary. Orale! Crema is seriously one of my favorite restaurants in New York & damn the Iron Chef America for that horrible verdict!!!! Juilieta should have won! Ruben, I don’t have her e-mail. You can try calling the restaurant. Tatiana, this website is not a way to contact Chef Julieta. We are not associated with her. Please call the restaurant.